Experience a fall vacation of reds, oranges, golds, and greens that tint the maple forests in the Lake Gogebic Area from mid-September to early October. Ninety percent of the area is forest covered, so your eyes will have plenty to take in. Bond Falls is one of those “best kept secret” spots in the Upper Peninsula that you want to make sure you do not miss. 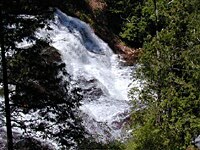 This beautiful water fall is located on the middle branch of the Ontonagon River near Paulding. Although it does not get the “press” of more famous U.P. water falls, Bond Falls has a large following of admirers and had even been part of a calendar listing the most scenic natural places in the world! Large beautiful waterfall that is visited by many people. Located just off of M-28 The short hiking trail is well-marked and easy to find.Directions: Go 6.5 miles East of Bruce Crossing on Hwy M-28. You will see a sign on the Hwy at the Bridge. Park in the parking area on the south. Follow the well marked trail under the bridge to the waterfall. The National Black River Scenic Byway includes Great Conglomerate Falls, Potawatomi, Gorge, Sandstone, and Rainbow Falls. — Video of Conglomerate FallsThe National Black River Scenic Byway includes, Great Conglomerate Falls, Potawatomi, Gorge, Sandstone, and Rainbow Falls. As you visit our waterfalls, stop and take notice of the signs explaining the conglomerate rock formations.Directions: From Hwy. US 2 in Bessemer take Powderhorn Rd North. When you come to the T in the road at the stop sign, make a left hand turn on Black River Rd. You will find all the waterfalls on this Road. This road is approximately 14 miles long, ending in the only Harbor & Marina operated by the USDA Forest Service in the lower 48 states.